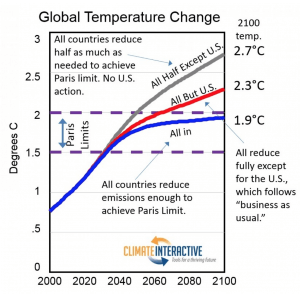 The analysis shows that, to achieve Paris temperature limits, climate leaders will need to advocate for both the U.S. reducing its own emissions and the U.S. engaging the rest of the world in emissions reductions through diplomacy, finance, and collaboration. We are writing to supplement his excellent coverage of our thought experiments with some notes about the assumptions behind the scenarios. All in. All countries reduce emissions enough to achieve Paris limits. This scenario is one of over 600 that we created for our analysis of what mid-century strategies would need to look like in order to limit warming to “well below 2°C with an effort to achieve 1.5°C.” In short, countries deliver fully upon their Paris pledges, peak their emissions no later than 2030 and reduce emissions at least 3% per year thereafter. Developed countries reduce emissions at 5.0% per year after 2030 through 2100. Three exceptions are the U.S., Canada, and Mexico, which follow their announced “mid-century strategies.” We assume no carbon dioxide removal beyond the afforestation pledged in NDCs. Note that this scenario is not designed to be a likely future—we can’t imagine a future in which the U.S. alone missed the decarbonization revolution—but instead it is offered as a “thought experiment” to improve understanding of this complex system. In this scenario, all countries but the U.S. follow the same trajectory as the “All in” scenario above, but the U.S. follows its “business as usual scenario” of continued growth in fossil fuels, and lack of success in energy efficiency and land use improvements. All half except U.S. All countries reduce half as much as needed to achieve Paris limit. No U.S. action. We translate “half as much as needed” into our model by having countries achieve only 50% of their NDC, cutting the reduction rates of 3.0% and 5.0% down to 1.5% and 2.5%, and by having Mexico and Canada only achieve 50% of the “mid-century strategy” reduction by 2050. Countries do half as much as they did in the “All in” scenario. The assumptions are the same as in the “All half except U.S.” but the U.S. achieves half of its “mid-century strategy”. The analysis used the C-ROADS (Climate-Rapid Overview and Decision Support) policy simulation model, which is calibrated to the Intergovernmental Panel on Climate Change’s (IPCC) Fifth Assessment Report results. C-ROADS was developed by Climate Interactive in partnership with the Massachusetts Institute of Technology Sloan School of Management (MIT Sloan). The simulator employed here is freely available, so anyone could recreate the scenarios for themselves in C-ROADS Pro, or in a more simplified form but a more friendly interface with C-ROADS World Climate. For further information: www.climateinteractive.org. Contact us at info@climateinteractive.org.